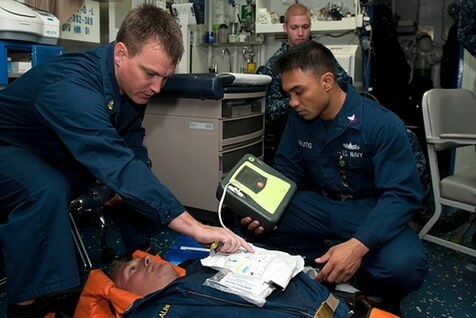 The wonders of modern technology mean that serious medical emergencies such as cardiac arrest can be treated on the spot. All you need is an automated external defibrillator close at hand, and lives in your workplace can be saved. But like all great inventions, the defibrillator did not arrive overnight. In fact, it took centuries to realise the lifesaving potential of electricity, how to apply it, and to develop the device we know today. In essence AEDs are portable electronic machines that can automatically diagnose irregular heart beats and treat it though electrical therapy. It’s much more effective than CPR, which really just sustains life before a defibrillator can be found. Coronary heart disease is a leading cause of death in Australia with the Coalfields district of New South Wales having one of the country’s highest rates. A study of the people in the Appalachian coal mining areas found significantly higher risk of cardiovascular disease amongst these people. In case of a cardiac arrest, an AED can help save lives. Find out how you can save lives at your mine, get in touch with Alsco at the AIMEX from September 1-4, 2015. The irregular heart beat is created by ventricular fibrillation, which is when the heart muscles begin to contract in an uncoordinated way. A second heart condition treated by a defibrillator is ventricular tachycardia, which is more commonly known as a racing heart. Defibrillation is a process that restores the regular pattern of muscular contraction in the heart, much like giving the heart a jump start. But if these conditions are not treated with defibrillation quickly, both can lead to death. The good news is that, not only can an AED save lives, they are also simple to use. So, even if you have never used one before, the chances of successfully reviving someone is extremely high. But that’s not to say that training is not necessary. Knowing immediately how to operate an automated external defibrillator greatly increases the chances of saving a life. Research has shown that for every minute that a person in cardiac arrest is not treated, the chances of survival falls by 7%, and after 3 minutes, it falls further to 10%. So, speed is of the essence. Receiving proper instruction is logically essential. And while the method is straightforward, there are some important basic facts to bear in mind. Clear the Way – defibrillators can’t work through clothing; electrodes must touch the skin. Electrode Position – electrodes must be placed high on the left and low on the right of the heart – think 10:20 on a watch face. Of course, a certified training course will provide far more instruction on how to operate an automatic external defibrillator than the short list above, so be sure to take one or send selected staff to take one. 1775 – Experiments on chickens by Danish physician Peter Christian Abilgaard reveal hearts could be stopped and then restarted by electricity. 1850 – German physician Carl Ludwig documents electrically stimulated ventricular fibrillation in dogs. 1888 – British physiologists John A Mac William suggests ventricular fibrillation might be the cause of sudden death. 1899 – Swiss physiologists JL Prevost and F Batelli confirm strong voltages applied directly to the heart could restart dogs hearts. 1928 – US Electrical Engineer William Bennett Kouwenhoven began developing defibrillators. 1947 – US surgeon Claude S Beck is the first to save a human life through defibrillation, restoring his 14-year-old patient’s heart beat during a surgical procedure. 1956 – Kouwenhoven develops external defibrillators but during his experiments discovers and develops CPR. Harvard cardiologist Paul M Zoll demonstrates the first closed chest (external) defibrillation. 1960 – Portable DC-powered defibrillators are developed by Harvard’s Bernard Lown and University of Washington’s K William Edmark, allowing treatment outside hospitals for the first time. 1966 – In N Ireland, cardiologists J Frank Pantridge and John S Geddes are the first to install portable external defibrillators in an ambulance, creating the first Mobile Intensive Care Unit. 1978 – the first Automated External Defibrillator is introduced, comprising sensors to detect in ventricular fibrillation. Crucially, the instructions are electronically provided, reducing the degree of training required to operate them. 1980s – Computer technology enhances AED sensitivity, helping to save even more lives. 2000s – Workplace Health and Safety standards introduced around the world highlight workplace automated external defibrillators as essential. We all know that time is very important especially in saving lives. Alsco can supply your business with a managed Automated External Defibrillator (AED) service to make sure you have access to a high quality, affordable Automated External Defibrillator at all times. For even faster service and find out all the details, get in touch with Alsco at the AIMEX or call Alsco now! Our representatives are waiting to help you.